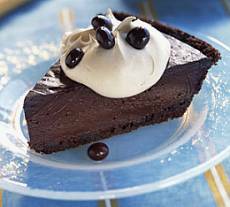 When you want to serve a very chocolaty and indulgent dessert for a special occasion or during the holiday season, make this rich chocolate ganache pie. It is heaven, especially for the chocolate lover's at your table. Microwave chocolate and whipping cream in medium bowl on HIGH for 2 minutes or until chocolate is almost melted, stirring every minute. Beat with wire whisk until chocolate is completely melted and mixture is well blended. Add the 2 tbsp. of jam; mix well. Pour into crust; cover. Refrigerate 4 hours or overnight. Arrange raspberries or whole strawberries on top of pie *(See Note Below), OR spoon a dollop of whipped cream on each slice of pie and top with a few coffee beans, OR simply serve pie with whipped cream on the side so guests can serve themselves. Microwave the 4 tablespoons raspberry or strawberry jam and the water in a small microwaveable bowl on HIGH for 30 seconds; stir until well blended. Brush over raspberries or strawberries. Refrigerate pie until ready to serve. Ridiculously easy, I felt like I was cheating! My family couldn't believe how amazing and decadent it was. This was so easy, and tasted amazing. It looks like a complicated and fancy dessert. I've made it at least 3 times for the holidays, and people just gobble it up. I use the chocolate from Trader Joe's. Super easy, absolutely delicious. I couldn't find chocolate pie crust, but I used normal sweet shortcrust instead, worked out beautifully all the same. Absolutely delicious recipe.